A supernova is usually a huge explosion that destroys a star, leaving only a small remnant of material behind. But astronomers recently discovered a star that went supernova at least twice — meaning that the model for star explosions needs to be re-examined. Stars shine from regular fusion of elements inside of the core; for example, our sun currently fuses hydrogen nuclei into helium. The sun isn't big enough to go supernova, but stars that are eight to 15 times the mass of the sun can. They either generate supernovas called Type II supernovas, or collapse into black holes. If the stars are going supernova, they first fuse heavier and heavier elements up to carbon. Once the star's core passes a mass called the Chandrasekhar limit, the star implodes, the core grows even warmer and denser, and the implosion causes the core to rebound and explode. When the core bursts, it shoots the star's material into space, creating a supernova. But that's not what happened in the case of iPTF14hls, an explosion that was found in 2014 by the Palomar Transient Factory, which is an automated camera survey that looks for events in the sky such as exploding supernovae or comets passing by. As usual, astronomers did a spectroscopic analysis of the explosion, yielding information about its chemical composition and the speed of the explosion. Astronomers initially pegged the explosion as a Type II-P supernova; the "P" means that the brightness of the light plateaus for some time after the explosion, as opposed to Type II-L stars that have a more variable brightness. But then things got weird. While most Type II-P supernovas fade after 100 days, iPTF14hls stayed shining for more than 600, and in fact had variable brightness. Astronomers also uncovered a 1954 explosion in archival data in the very same spot. In other words, the star exploded six decades ago and somehow survived. 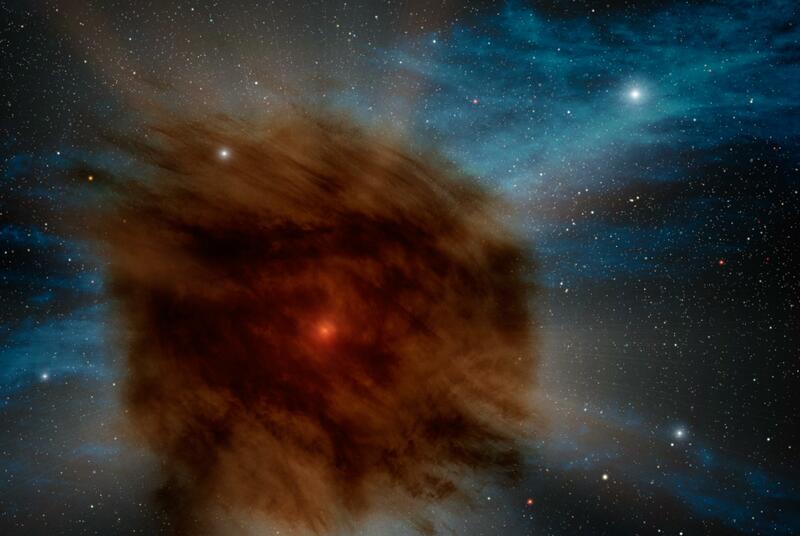 More weirdly, modeling suggested that the star exploded several times during the last few decades of its life, and that it was much larger when it was first formed — somewhere between 95 and 130 times the mass of the sun, according to the paper. The astronomers, however, remain puzzled as to how the star survived such a violent history, and suggest that we need to revisit our understanding of how massive stars evolve and explode. "This supernova breaks everything we thought we knew about how they work," said lead author Iair Arcavi of the University of California Santa Barbara and Las Cumbres Observatory, in a statement. The research was published in the journal Nature. In an accompanying "news and views" article in Nature written by astronomer Stan Woosley, who did not participate in the research, he pointed to several other unusual aspects of this star that struck him from reading the research. The explosion varied in brightness. The spectrum of the light had consistent lines, indicating that material from the star was not slowing down as expected. The explosion also stayed at about the same temperature through its peak, instead of cooling down as it expanded (a basic of radiation theory). The most plausible scenario the authors put forward is a model in which a huge star has "supernova-like outbursts" near the end of its life. In other words, instabilities as nuclear fusion ceases would cause a series of explosions that shoots out material from the star without utterly destroying it. More stellar mass would also be lost to stellar winds and other pulses earlier in the star's lifetime. But the model has a few limitations, Woosley pointed out, such as not accounting for how the supernova kept a constant temperature. Additional study of iPTF14hls will be needed to better formulate a model of its later days. Astronomers will also keep an eye on the sky to see if other strange supernovas of its type pop up.